Section Zero was originally published in 2000 by Gorilla Comics. 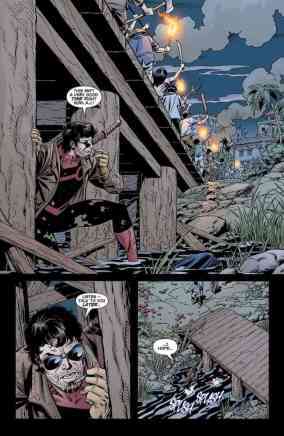 The series sadly saw only three issues released. A recent Kickstarter fund helped the book resurface in a trade. Image is publishing. The book is a sci-fi story where Section Zero is a group that investigates unusual occurrences. They try to see what’s up with the Lochness monster and such. Tom Grumment was one of my favorite illustrators over the last several plus years. I’ve always enjoyed his work on The Titans. It’s a welcome sight to see his pencils with Karl Kesel’s inks back in print. I know that this is simply a re-issue. As far as the story goes…it’s a nice X-files sort of thing. The uniforms are slick design but I can’t figure out why Tina, the team leader, isn’t wearing pants. She has a one-piece on with long sleeves but where does she put the large gun she’s carrying. Otherwise the story has a deeper and more sinister plot built in with one of the side characters. The story also has a cool alien and bug kid to round out the team on it’s first issue. It’s a good build up to what’s going to happen in the next issue. If you like science fiction and a little 90’s style art, this is a good book to pick up. We can hope Kesel and Grummet get to produce more stories about this team.